These casamiento wraps are a new twist on El Salvadoran comfort food. “Casamiento,” meaning marriage, is the combination of rice and beans. This dish is very popular in El Salvador as well as other Latin countries. Many cooks will add in other ingredients, thus, personalizing the dish. This recipe is my interpretation of a dish I learned from two El Salvadoran women who are authentic home cooks. What I love about casamiento is that it combines simple, inexpensive ingredients into a meal with interesting flavors and textures. I love the way creamy red beans contrast with chewy brown rice. Also, the dish is a great use of leftovers. It makes a perfect vegan meal, or any meat protein can be added. Here’s the details of how I make casamiento. All the ingredients are natural and unprocessed. The dish has four components: beans, rice, tortillas, and toppings. The beans and rice are mixed together and then put in a tortilla with toppings. I use dried small red beans which are popular in El Salvador. These are not kidney beans, which are larger. The small red beans have a smooth texture and are slightly sweet. Black beans are another option and are used in some other countries. I like to purée the beans, but it’s common to smash the beans with a potato masher and leave them partially chunky. I make a big pot of beans from scratch with dried beans. It is easy to boil them and worth the time for a much superior flavor over canned beans. Plus, I get four family meals out of one pot of beans. Whatever we don’t eat right away, I freeze in batches. 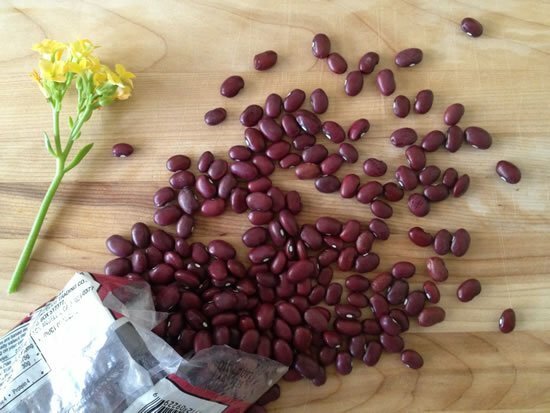 It’s quick and convenient to have cooked beans waiting in the freezer for future meals. Part of the secret for cooking from scratch with real, whole ingredients is finding ways to cook once but end up with multiple meals. I prefer brown jasmine rice because it is aromatic and slightly nutty. To add more flavor and nutrients to the rice, I cook it with a purée of sautéed vegetables. Some kids prefer not to see little flecks of vegetables so puréeing works well. Alternatively, the dish is tasty with small chunks of finely chopped vegetables, which is a nice contrast in texture. For the cooking liquid, I use chicken stock, but water is fine too. If a thick vegetable stock is used, then the puréed vegetables aren’t necessary. 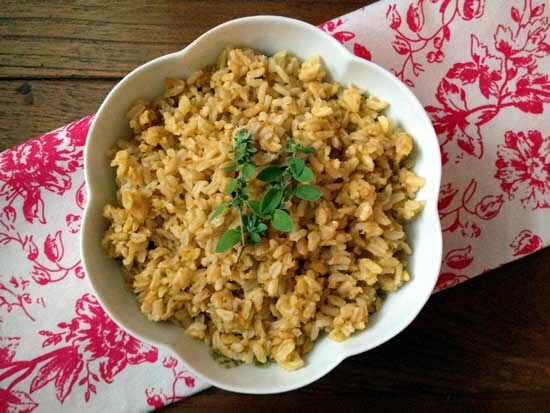 I often make this vegetable rice as a side dish to fish or chicken earlier in the week. I make extra rice which keeps well in the refrigerator for at least several days. Then I use the rice in my casamiento recipe. Once again I am happy when I can cook once from scratch, but yield more than one meal. 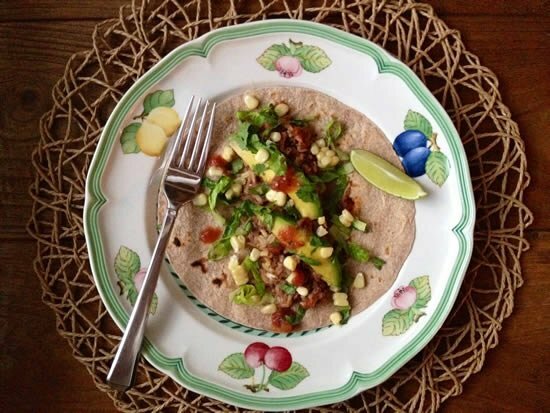 I had some trouble finding unprocessed whole wheat tortillas that pass “the kitchen test.” Except for Ezekiel Sprouted Grain Tortillas, I struck out at Trader Joes. [Andrew’s Note: I have found unprocessed, “handmade” 100% Whole Wheat Tortillas at TJ’s, so they sometimes do carry them.] Thankfully, the Whole Foods brand tortillas pass. I’d like to try this recipe for homemade tortillas. I think once I taste homemade, there will be no turning back. I sure hope they freeze well. 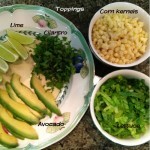 My favorite toppings are cilantro, fresh corn kernels, avocado, salsa, shredded lettuce, and a squeeze of lime. I usually have these toppings leftover in my refrigerator after taco night at my house. Another tasty addition is sautéed summer squash or roasted winter squash. Also, many different proteins can be added such as cheese, chicken, meat, or fish, whatever is leftover in the refrigerator. Leftovers taste amazing inside a Casamiento Wrap. So, the meal is economical, quick to prepare from leftovers, and delicious. The rice and beans mix alone is a satisfying, comforting dish, but the toppings add a burst of flavor. So, let your creativity go wild, and have fun picking out your favorite toppings. Once the cooked rice and beans are in the refrigerator, this dish comes together in 5 minutes. The "refried" red bean recipe below makes enough for about 16 servings. The vegetable brown rice instructions makes enough for about 8 servings. Sort the beans to remove little rocks and damaged beans. Rinse to remove mud. Place a large pot on the stove and stir in water, salt, beans, garlic and 1 onion cut into quarters. Turn the flame on high, leave uncovered and bring to a boil. Then, reduce the flame to medium low, stir, and let simmer. Stir occasionally and leave uncovered for most of the cooking time. Monitor the beans for enough water and doneness. Cook until the beans are tender. The cooking time varies from bag to bag and takes from one to two hours. The beans are not ready if they are white inside and have a sandy texture. Taste several beans in the pot for doneness, sometimes some beans are cooked and some are not. When the beans are done, you want about one cup of cooking liquid left in the pot. If most of the water cooks out before the beans are soft, add an additional 1 cup of hot water as needed. Once much of the water has cooked out, finish cooking with the lid ajar to keep the beans moist. In a sauté pan on medium low heat, sauté 1/2 of a chopped onion in 1 tablespoon oil until the onion turns light brown and caramelizes. Once the beans are tender, purée them with the remaining cooking liquid (about 1 cup) and the caramelized onions. Use an immersion blender in the pot or a regular blender. Then add 1 teaspoon more oil to the sauté pan and lightly re-fry the puréed beans. Start with the flame on medium and stir frequently to prevent the beans from sticking. Once the beans start swelling and boiling, reduce the flame to medium low. Continue cooking and stirring for about 20 minutes or until the beans are a consistency that is not too watery and not too dry. The consistency is similar to mashed potatoes. In a medium-sized pot heat the olive oil. Add the chopped vegetables, and sauté on medium low heat until tender. Add a small amount of the broth and purée the vegetables using an immersion blender in the pot, or use a regular blender. Have the pureed vegetables in the pot, and add the rice, the rest of the broth, and salt. Stir, then bring to a boil using high heat. Then reduce the flame to low, cover and cook for the time recommended on the rice package, usually about 40 minutes. Cook rice until just done and each grain has a slight firmness to it. Do not over cook. In a bowl stir together some refried red beans and vegetable brown rice with a 50-50 ratio. Place a tortilla on a microwaveable plate. Add the rice and beans mixture on top. Also add any toppings that need heating like corn, cheese, chicken, sautéed vegetables, etc. Microwave until warm, about 1 minute. 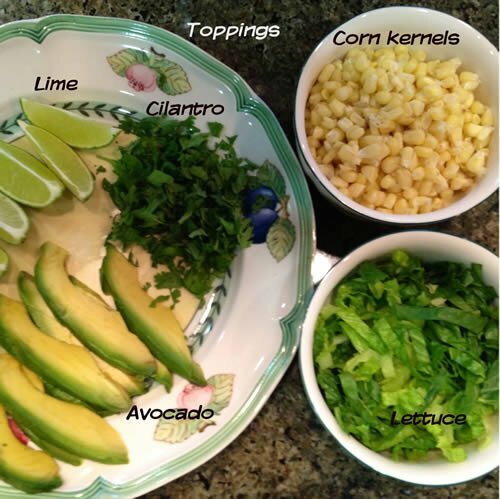 Add on any cold toppings like cilantro, lettuce, avocado, salsa, and a squeeze of lime. Fold up the wrap and enjoy. Thanks, Dana! This sounds like Sunday dinner to me! A recipe after my own heart! I made a big pot of pinto beans two days ago (some leftovers in the fridge, some in the freezer), and I am a huge brown basmati rice advocate. I love the suggestion to cook the rice with pureed veggies, that had actually never occurred to me. Cheryl and Stacy- I’m glad you like the recipe. Stacy- your variations sound great. I like basmati rice too because it’s aromatic. This makes me so happy! I am a huge huge fan of anything that isn’t the typical American fare and going to restaurants that serve it is one of my major weaknesses. I was most worried about how I was going to swing my monthly (or more) dining out nights with friends in October. I am thinking I can have them over for some homemade casamiento wraps instead!! Jennifer– I completely agree. I enjoy eating foods from different cultures too. It adds so much variety. Dana, I made this for dinner tonight and we loved it! 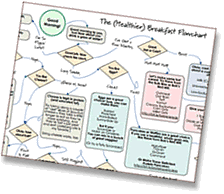 It is slightly labor-intensive, but not difficult at all! We especially loved the vegetable rice. I did add a little spice, because we love spicy food. We have leftovers for the week and a quart of “bean juice” (left from boiling the beans) for use in soup or a stew later in the week. Thanks again for sharing your recipe! Cheryl, thanks for trying the recipe. Glad you loved it and that your effort produced so much unprocessed food for the week. Adding in some spice is a great idea. There are endless possibilities to personalize the recipe.